This year’s Hong Kong Art Fair had all and more of my favourite Beijing galleries exhibiting alongside international galleries representing big name artists from Damien Hirst to Tracy Emin, Barnaby Furnas, Yayoi Kusuma, Maurizio Cattelan, Rudolf Stingel, Piotr Uklanski and Chinese artists heavyweights Zeng Fanzhi, Cao GuoQiang as well as a fitting marble arm by Ai Wei Wei. The stellar list goes on. I also checked out the Singaporean artist Heman Chong’s works, represented by the Singapore Tyler Print Institute . 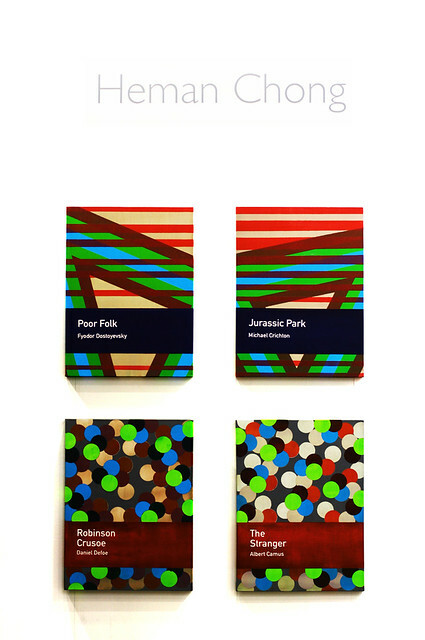 Chong’s works at the fair featured pop art covers of classic fiction: Albert Camus’ The Stranger and Daniel Defoe’s Robinson Crusoe–his key objectives to investigate philosophies, reasons and methods of individuals/communities in the future. Recreating the covers of literary classics, he aims to “communicate the titles and the authors stories of selfhood” through the “neoconstructivist” shards of colours, where one is invited to experience the solitude in the referential object (in this case the classic fiction covers). 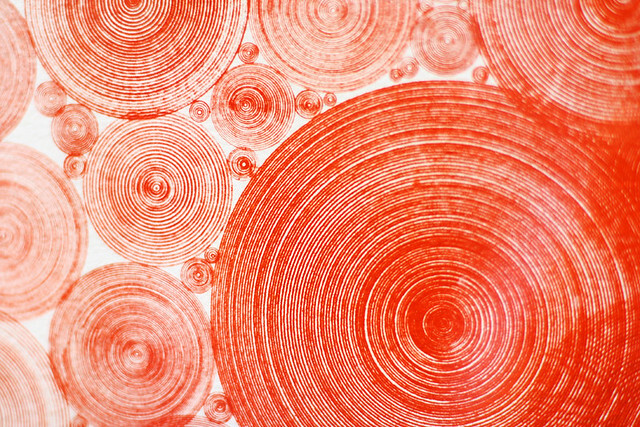 Exhibiting alongside Chong was Korean artist Do Ho Suh featuring ephermeral pieces of hand drawn concentric circles of a dizzying effect, whose “mirrored symmetry is Suh’s prevailing theme of Karma” and thread drawings that looked like a child’s doodle charting her personal journey. 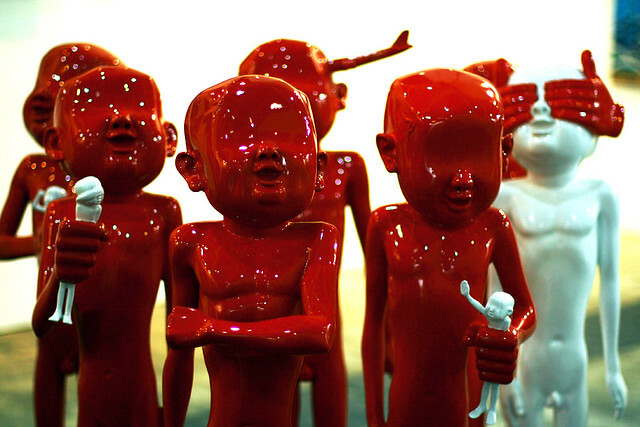 One of Beijing’s oldest galleries Red Gate showcased Island 6’s LED installation pieces while Pekin Fine Arts featured one of my favourite artist Liu Bolin who camoflages in his surroundings. 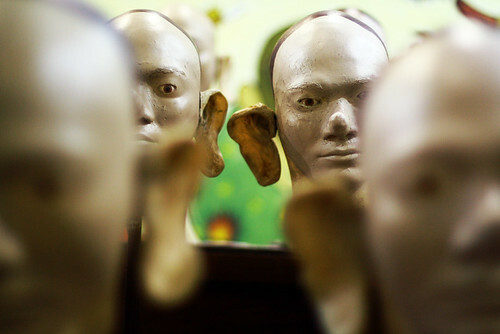 Other amazing works include the Indonesian Collective Tromarama’s “More We, Less Me” and Indonesian artist Heri Dono’s “Pinocchio Syndrome. 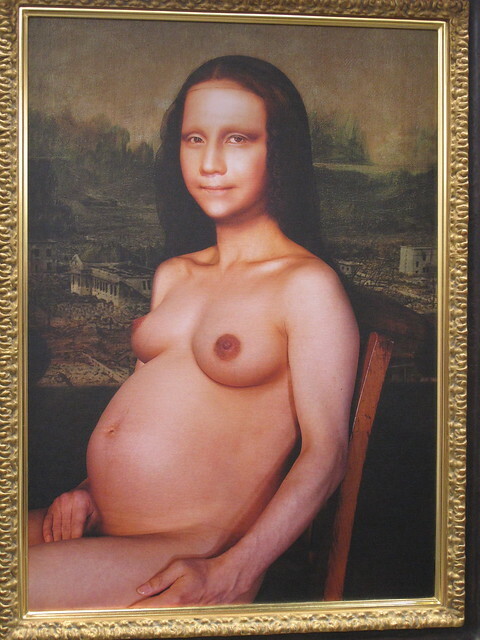 Morimura Yasumasa’s Mona Lisa’s pregnancy series. Artist Atsushi Kaga represented by Irish gallery Mothers Tank Station created a series of cats installations. Too cute. 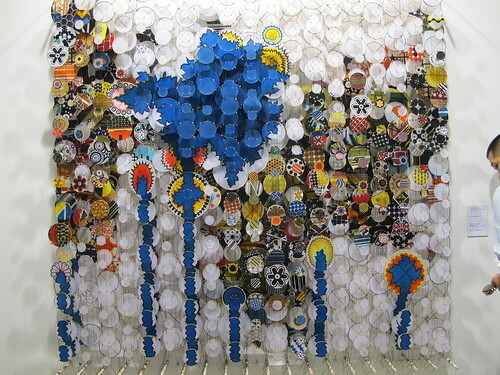 And a giant wall of “stuff” by Jacob Hashimoto was reminiscent of a giant dream weaver to me. 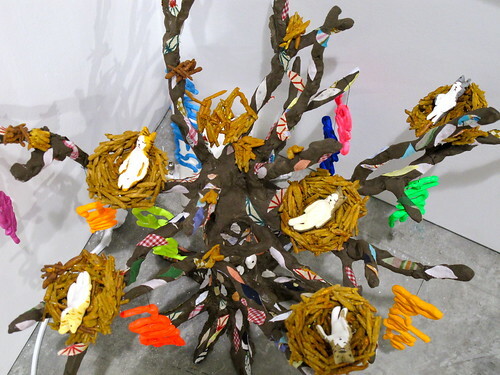 This year’s fair like those of the years before showcased an impressive and extensive collection of art, best of all it was nice seeing Singaporean artists exhibiting alongside international big names. Photos by Lilian Yeung and Juliana Loh. See the full album here. 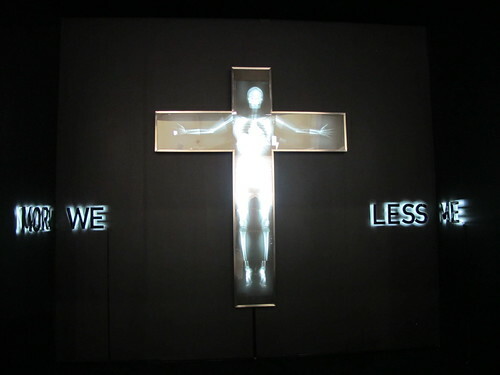 What’s up with the Singapore Arts Festival’s 2011 campaign?